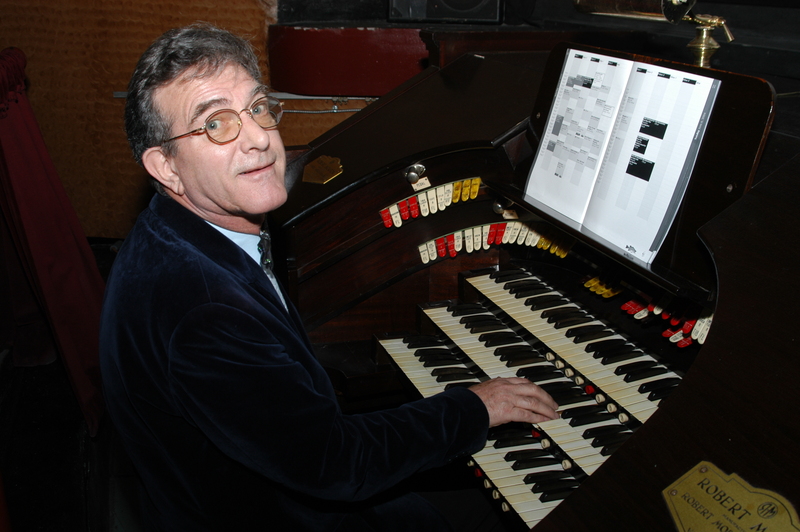 With regret, we share news of the passing of Jeff Barker, beloved – and renowned – theatre organist and devoted friend of the Adirondack Film Society and the Palace Theatre. Jeff passed away suddenly on December 31, 2013. A native of Manchester, England, Jeff began piano lessons at age 5. He later attended the Manchester School of Music, majoring in piano. While still in his teens, his interest shifted to the Theatre Pipe Organ, and he joined the Theatre Organ Club and the Cinema Organ Society in England. He soon found himself playing “Organ Interludes” at such places as the “Carleton” in Salford, and the prestigious “Odeon” (formerly the “Paramount”) in Manchester City Center. In the mid 1960’s Jeff came to the U.S. to play a summer season on the 3/14 Wurlitzer organ that was then installed at the Surf City Hotel on the Jersey Shore. He decided to stay in America, and subsequently became a U.S. citizen. Over the course of his career, Jeff played most of the important instruments of his trade in the U.S. and England, and was a featured organist at three American Theatre Organist Society conventions. He also played for the Theatre Organ Society International at the Byrd Theatre in Richmond, Virginia. Jeff served as house organist at theatres operated by Nelson Page in the New York Metropolitan Area for over 16 years. Many appreciative movie audiences had heard him play the 3/12 Kimball and the 2/6 Moller Lobby Organ at the now-closed Galaxy Theatre in Guttenberg, N.J., and the 2/11 Wurlitzer at the Lafayette Theatre in Suffern, N.Y. He also played before the Big Screen Classics Movies shown at the Lafayette. Since 1999, Jeff played the Robert-Morton Theatre Pipe organ at the Palace Theatre in Lake Placid, N.Y., and was also the crew chief for the restoration of the Palace’s organ. Jeff and his work are synonymous with the Adirondack Film Society, the non-profit organization that has produced events throughout the North Country and at the Palace Theatre for 15 years. Jeff was at the organ when the AFS launched its first official event in October 1999. The successful event provided a strong start for the inaugural Lake Placid Film Forum in June 2000. Every October since, Jeff has been at the organ for silent film events produced by the AFS. On Halloween night this past October, 2013, Jeff was truly at his best as he introduced the film, played accompaniment on the organ, and even handled the Q&A afterward; he was the whole show, and the audience was immensely appreciative of his efforts and abilities. An additional, little-known talent Jeff possessed was an artistic ability with a paint brush. In fact, it was Jeff who restored much of the decorative paint and gilding when Nelson Page took over operation of the Lafayette Theatre. For this, his organ playing, and for many other reasons, he will be greatly missed. Thanks to the Garden State Theatre Organ Society for providing much of the information in this article. I met Jeff Barker in the presentation of the newly finished organ in Lake Placid, NY for the Lake Placid Film Forum…his abilities to work with film and just about any theatrical presentations will be missed…blessings to his family.